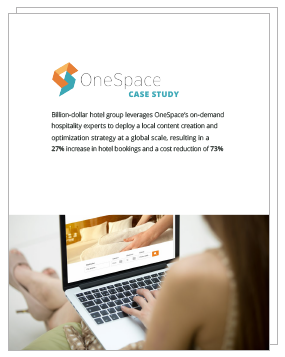 Learn how a billion-dollar hotel group leveraged OneSpace's on-demand copy writers to deploy a local content creation and marketing strategy at a global scale. Reduce direct costs and increase bookings by partnering with OneSpace's network of expert freelance writers and data specialists. See how a leading hotel group reduced costs by 73% and increased online bookings by 27% using OneSpace's workflow automation and on-demand talent platform. In the meantime, check out some of our use cases.